The import dependence of Slovenia is increasing primarily due to the increase in the use of liquid fuels. The most problematic is the import dependence on gaseous fuels, since Slovenia is strongly dependant on imports from Russia and Algeria. The environment and import dependence are connected through a mix of fuels used for the provision of energy services, scope of services and types of transfer routes used for transport. The level of net energy import is dependent on several factors, including economic ones: the trends of final energy consumption, efficiency of the energy system, especially of electricity and heat production, the scope of domestic production of fuels and energy, including also renewable energy sources. Among other things, the consumption efficiency also influences the trends of final energy consumption. The supply reliability is placed very high by the EU in its energy policy. Significant documents referring to this area are: the climate-energy package, which was adopted by the Council in April 2009, the Second strategic energy review, which was published by the Commission in 2008, Action plan for energy efficiency (2006). This problem became especially important during the winter of 2008/2009 due to problems in the natural gas supply, as a result of the Ukraine-Russia conflict. 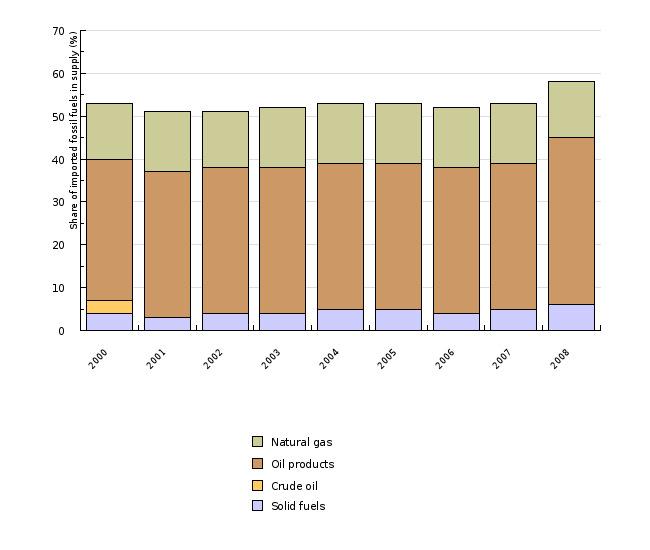 Slovenia imports the majority of its fossil fuels. In terms of liquid fuels, the dependence is 100 %, and for solid fuels 29 %. Domestic sources of solid fuels are the lignite mine in Velenje and the brown coal mine in Hrastnik. Imported fossil fuels represented 57 % in terms of total energy supply in 2008, which is 5 percentage points more than the previous year. Moreover, this is also significantly more than in the period 2000–2007, when the share was between 51 and 53 %. Such a high increase is especially a result of the higher consumption of liquid fuels (Figure 1). Slovenia imports fuel also for the nuclear power plant, which is statistically defined as a domestic fuel. Furthermore, Slovenia also imports liquid bio-fuels used in transport. Slovenia imports liquid fuels from several countries, whereby we have to be aware that the country of import is not necessary the country of origin of the fuel, especially due to reselling. 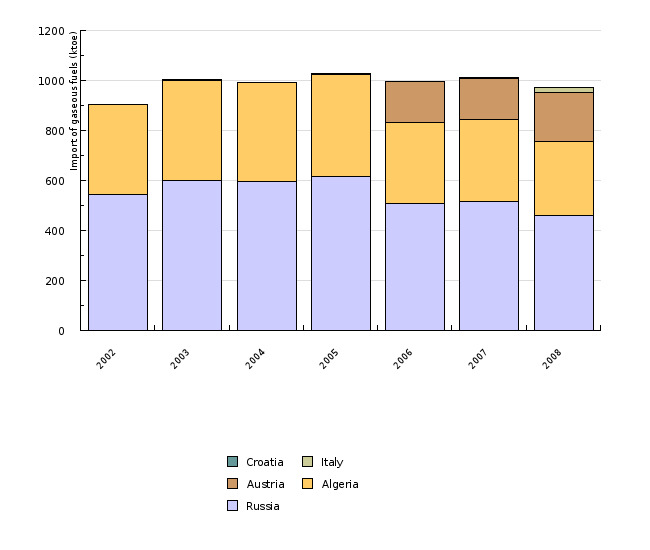 In 2008, the majority of liquid fuels were imported from Cyprus (almost 40 %), followed by Austria with 25 %, Switzerland with 13 %, Italy with 8 %, the United Kingdom with 6 % and Hungary with 4 %. Other countries represent less than 1 percent of the share. 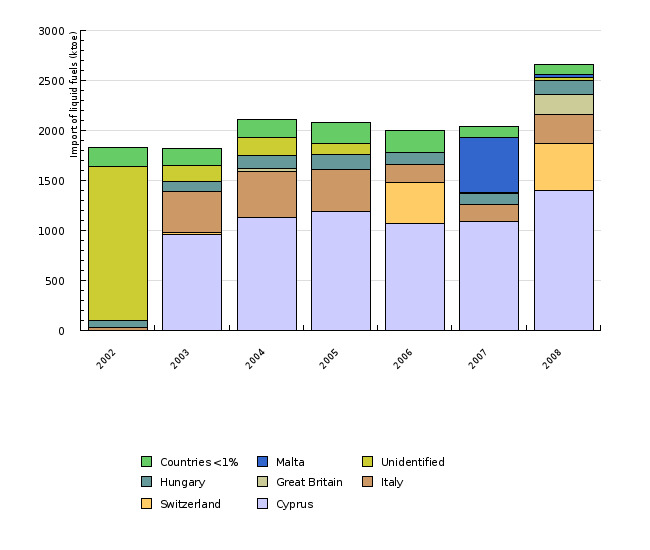 Cyprus has had the largest share since 2003, while in 2002 the largest share was taken by an undefined category. For solid fuels, there are also several countries from which Slovenia imports; however, the share of imported fuel from a country with the highest mass is significantly higher than in the area of liquid fuels. 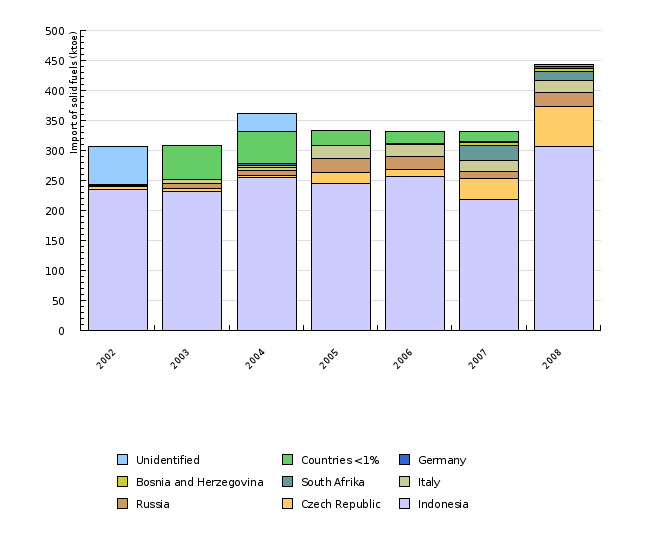 Namely, in 2008 69 % of solid fuels were imported from Indonesia. In the past, this share was even higher (in 2006, it amounted to 78 %). This fuel was used in the thermal power and heating plant in Ljubljana. Indonesia is followed by the Czech Republic with 15 %, whereby the share of this country strongly increased in comparison with previous years. This is a consequence of the mixing of coal in the Trbovlje thermal power plant; in the past, only domestic coal was used. Other solid fuels are used in final consumption, especially in industry, while some are still used in households; however, the amount of the latter is so small that is it not recorded in statistics. In the area of gaseous fuels, the situation in final consumption is the most problematic, which was also noticed last winter. The consumption of gas in transformations is minimal; the majority is used in industry, followed by households and other consumption. The main sources are Russia and Algeria. In Figure 4, a large share is also taken by Austria, which does not extract its own gas, but also imports it mainly from Russia and Algeria. If we distribute the gas from Austria between these two countries, Russia contributes 57 % and Algeria 40 %. In other words, Slovenia is highly exposed in the area of coal supply, where Indonesia is the largest supplier representing 69 % of all imported solid fuels; however, due to domestic production the share in total supply with domestic fuels is low (20 %). Therefore, this fuel is not problematic in light of the reliability of supply. More problematic are liquid fuels, where Cyprus represents 49 % in terms of the supply of liquid fuels, whereby this country is not the origin country of the fuel. A mitigating circumstance in liquid fuels is surely that there are more sources. Especially problematic is the provision of reliability for the supply of natural gas, where there are mainly two suppliers – Russia and Algeria. This is problematic also at the EU level, where several endeavours are conducted in order to expand the selection of sources and improve their accessibility. Three larger projects are in progress: the South corridor (source: Russia, target: Austria and Italy, Ukraine bypass), Nabucco (source: Turkey, target: central Europe), the Nord Stream (source: Russia, target: Germany, Ukraine bypass). - Wikipedia, 2009a. Nord Stream. - Wikipedia, 2009b. Nabucco pipeline. - Wikipedia, 2009c. South Stream.